GlobalVR has added content to their NASCAR Team Racing game once again, adding the popular Roush Fenway Racing team to the roster of drivers. If you are not familiar with them(as I wasn’t), they are a pretty big deal in the NASCAR world and you can visit their website here. While no game tweaks have been made in the update, the addition of four Roush drivers from that team is one way GVR seems to be using to keep NASCAR fans continually interested in the game. 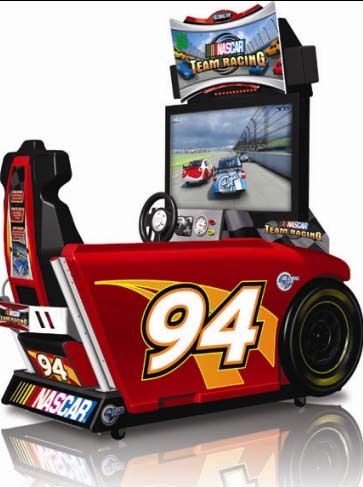 I haven’t been keeping track but NASCAR seems to be one of the most frequently updated arcade titles in recent memory as they constantly add new cars and drivers. I can think of a couple of other games I’d love to see receive some content updates to give the game more to explore. As for GVR, I am wondering what their next game might be, so far the new content they delivered this year was shown at Amusement Expo and that has been it so far. IAAPA is right around the corner though and there is usually something new to talk about there, especially since AMOA is no longer around in September. It would be great if they can have NTR online at IAAPA, I haven’t had a chance to play that “in the wild” so to speak and try out the online mode against another human player(s) and I’m still curious to see how that plays. As for the NASCAR update, for more details check out the press release below. The AAMA (American Amusement Machine Association) held it’s 7th annual Distributor Gala this week, an event that generally gives us a sneak peek into what to expect in arcades in the fall. Replay Magazine was there and took plenty of pictures from the event, giving us a good look at these new games. You can see all of the pictures here on Replay’s Facebook page; click the link below to see the video arcade highlights, including the new Super Bikes 2, Dead Heat and AVATAR Pinball. 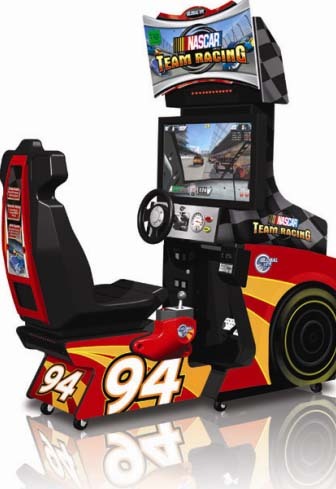 GlobalVR’s NASCAR Team Racing title is scheduled to have it’s online features activated today, allowing you access to new tracks as well as the ability to race against people in other connected arcades. As this feature wasn’t available at the shows I can’t say what it’s like but I certainly would like to test it out. Since we haven’t seen online play with this level of interactivity in US arcades for a while now (i.e. where you play an active game against someone else as opposed to posting scores), it’s a notable development. A few other companies currently have plans to put their racing games online as well (Taito’s Top Speed and UNIS’s Crazy Speed) but I do have a hope that we will see games that aren’t racers receive a similar treatment down the road. We could, if rumors about GlobalVR next taking Blazing Angels online hold out to be true. You can visit the official page for NASCAR here. What are your thoughts on the online arcade gaming scene? GlobalVR has updated their website with full details on their updates to both NASCAR and Twisted. We’ve covered those details before but here is a new trailer for the game that GVR posted to the site. They also put up some screens of the game which you can see here if you are interested. The game goes online on June 15th but cabinets featuring the update are available now.